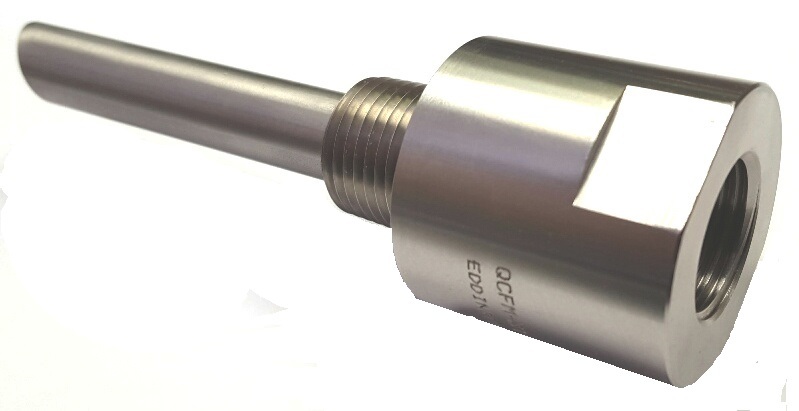 The Eddington QBFM & QCFM Injection Quills offers MNPT process connections and ½” FNPT pump side threads to make installation of the hose going to the metering pump easier. Most metering pumps have 1/4″, 3/8″, or 1/2″ hose that is connected to the metering pump via compression fittings. On the other end of the hose it is typical to have a 1/2″ MNPT connection that can be screwed into the Eddington injection quill on the FNPT side. Quills made from Type 316 SS, Alloy 20, Hastalloy C276 can be used for high temperature, high pressure applications. Crack pressure on the QCFM quills is 20 psi. If the pump cannot deliver 20 psi then a QBFM injection quill may be appropriate. These quills are available in Type 316 Stainless Steel, PVC, Kynar, Alloy 20, and Hastalloy C276. The QBFM has no check valve and is typically used with applications that require higher flow. They are also used in applications that do not require a check valve or applications that require and external check valve. The QCFM injection quills have built in ball check valves to prevent back flow through the nozzle and into the chemical feed line. There are two flat surfaces on the external portion of the nozzle so that a wrench can be used during installation of the injection quill. Install injection quill with telltale V notch facing into the flow for the most rapid dispersal of injected chemicals into the stream, there is a witness mark to identify the long end of the quill so installation is correct. Standard quill length is 2 ¾” but custom lengths up to 24” are available. For additional lengths please add the quill length desired to the end of the Eddington part number (e.g. QCFM-316-050-18). See Eddington’s QBFM-QCFM Product Data Sheet for more information on this new product! Eddington Industries, LLC is a proud member of the .